A family group outside the general store at Morgan, with the sign reading 'C. Duggin, Baker and Fruiterer' on the front. The group are (from left) Mrs Daniel McFarlane, grandmother of the two boys William Frederick and John James McFarlane, Mr Gilbert Duggin and his wife Kate Duggin, formerly Mrs James McFarlane, widow and daughter-in-law of Mrs Daniel McFarlane. [from information supplied]. At the time the photograph was taken Mrs. James McFarlane was married to Gilbert Duggin. 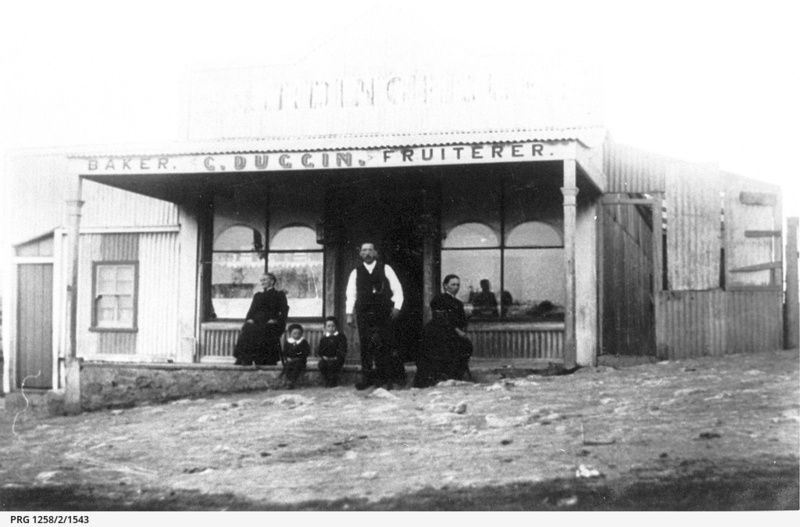 The shop was originally hers, and she was set up in the shop, by Captain Hugh King after husband, James McFarlane died. According to a researcher, the building is still there next to the Landseer Building, and the bread oven was also still there behind the house [noted 2017]. There are two photographs of Mrs Duggin, formerly McFarlane, nee Read, in the Godson collection, as she was before her marriages. Her name was Kate Read, and she was a stewardess on the paddle steamers. Kate Read's first husband, James McFarlane, died in 1887 as a result of a boiler rupture on the paddlesteamer 'Gem' at Wentworth. She married Duggin in 1891. According to Frances Heyer, the people in the image are Mrs Daniel McFarlane, and her two grandchilden, as named, and Gilbert Duggin and his future wife Kate, at that time still the widow of the late James McFarlane. The two boys are the son of Kate and the late James McFarlane. James McFarlane was scalded on the PS Gem and died 3 days later on 21st November 1887 in the Wentworth Hospital. See also PRG 1258/4/47.